Easy Drag and Drop printing of your printer output files. With PrintFiler, you can print files that have been captured using "Print to File", or automatically using Virtual Port Monitor. Copy to any printer installed on your computer. Even USB printers! 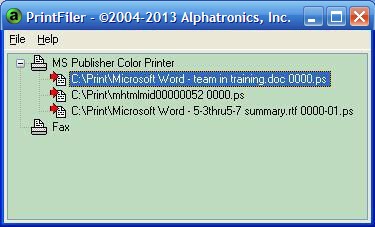 Please Note: This is a fully working copy of PrintFiler, but without a serial number, an evaluation message appears after each file printed. Prices are subject to change without notice. All sales are final. All brand names are the property of their respective holders.